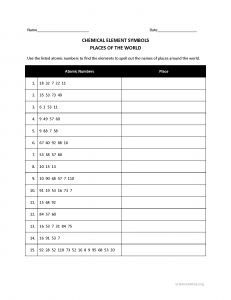 This element symbols worksheet is a 15 question worksheet aimed to familiarize students with the symbols of the elements and their location on the periodic table. Each question is a series of atomic numbers where the element symbols spell out a country’s name. A downloadable PDF of this worksheet can be found here. The answer sheet (and a list of answers) can be found here. If you need a periodic table, you can find one you like from our collection of printable periodic tables. There is also a list of the elements and their symbols in order of increasing atomic number if you need a handy reference.